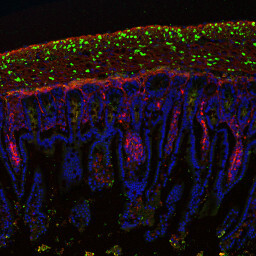 Cross section of intestine of a mouse model of myofibrillar myopathy. In red, alpha smooth muscle actin revealing muscle fibers. In green, mutant desmin causing myopathy, present as aggregates. In blue, the cell nuclei. Zeiss LSM 700 confocal microscope image of the BFA imaging platform. Dr. Alain Lienbaum and Dr. Eva Cabet.